Our 240 page Spring 2018 anniversary issue of Mystery Tribune is a must-have! This volume features previously unpublished short fiction from enduring voices such as Mickey Spillane and Max Allan Collins as well stories from Rob Hart and Todd Robinson. 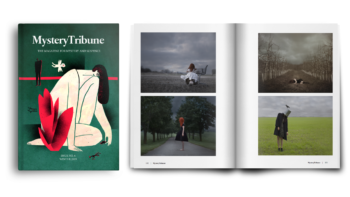 A curated collection of photography from European and American artists, interview with Megan Abbott and Alison Gaylin on comics thriller “Normandy Gold”, and some of the best voices in mystery and suspense are among the other highlights. An elegantly crafted quarterly issue, with a beautiful layout designed for optimal reading experience, our Spring 2018 issue will make a perfect companion or gift for avid mystery readers and fans of literary crime fiction. Stories by Mickey Spillane, Max Allan Collins, Frank Diamond, Nels Hanson, Rob Hart, Todd Robinson, Lynn Kostoff, and Charles Roland. Revisit of a classic essay in defense of crime fiction by Arthur Benjamin Reeve. Interviews and Reviews by Megan Abbott, Alison Gaylin, and Tom Andes.